Multnomah County /mʌltˈnoʊmə/ is one of 36 counties in the U.S. state of Oregon. As of the 2010 United States Census, the county's population was 735,334. Its county seat, Portland, is the state's largest city. 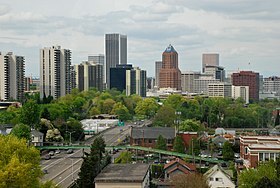 Multnomah County is part of the Portland-Vancouver-Hillsboro, OR-WA Metropolitan Statistical Area, and though smallest in area, it is the state's most populous county. Multnomah County (the thirteenth in Oregon Territory) was created on December 22, 1854, formed out of two other Oregon counties – the eastern part of Washington County and the northern part of Clackamas County. Its creation was a result of a petition earlier that year by businessmen in Portland complaining of the inconvenient location of the Washington County seat in Hillsboro and of the share of Portland tax revenues leaving the city to support Washington County farmers. County commissioners met for the first time on January 17, 1855. The county is named after the Chinookan word for the "lower river", Multnomah, Matlnomaq, máɬnumax̣ being interpretive English spellings of the same word. In Chinook Jargon, Ne-matlnomaq, means the "place of matlnomaq" or the (singular) Ne-matlnomag, "the lower river", from the Oregon City Falls toward the Columbia river. Alternatively, Chinookan máɬnumax̣ (also nímaɬnumax̣) ‘those toward water’ (or ‘toward the Columbia River’, known in Chinookan as ímaɬ or wímaɬ ‘the great water’). The explorer William Clark wrote in his Journal: "I entered this river...called Multnomah...from a nation who reside on Wappato Island, a little below the enterence" (quoted from Willamette Landings by H.M. Corning). (see:Portland Basin Chinookan Villages in the early 1800s, Boyd and Zenk,) Although Clark refers to the Willamette River as Multnomah, he may not have understood the meaning. Simply put, Multnomah("down river" or "toward the great water")is the shortened form of nematlnomaq/nímaɬnumax̣". In the 2000 presidential election, Multnomah played a decisive role in determining the winner of the state's electoral votes. Al Gore carried the county by more than 104,000 votes, enough to offset the nearly 100,000-vote advantage that George W. Bush had earned among Oregon's 35 other counties. The Democratic tilt was repeated in 2004, when John Kerry won by 181,000 votes, and in 2008 when Barack Obama won by 204,000 votes. Faced with decreasing government revenues due to a recession in the local economy, voters approved a three-year local income tax (Measure 26-48)  on May 20, 2003 to prevent further cuts in schools, police protection, and social services. 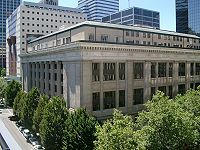 Multnomah County was one of the few local governments in Oregon to approve such a tax increase. According to the United States Census Bureau, the county has a total area of 466 square miles (1,210 km2), of which 431 square miles (1,120 km2) is land and 34 square miles (88 km2) (7.4%) is water. It is the smallest county in Oregon by area. It is located along the south side of the Columbia River. As of the 2000 census, there are 660,486 people in the county, organized into 272,098 households and 152,102 families. The population density is 1,518 people per square mile (586/km²). There are 288,561 housing units at an average density of 663 per square mile (256/km²). The racial makeup of the county is 79.16% White, 5.70% Asian, 5.67% Black or African American, 1.03% Native American, 0.35% Pacific Islander, 4.03% from other races, and 4.07% from two or more races. 7.51% of the population are Hispanic or Latino of any race. 16.0% were of German, 9.0% English, 8.8% Irish, and 5.1% American ancestry. 83.5% spoke English, 6.3% Spanish, 1.7% Vietnamese and 1.3% Russian as their first language. In the county, the population is spread out with 22.30% under the age of 18, 10.30% from 18 to 24, 33.80% from 25 to 44, 22.50% from 45 to 64, and 11.10% who are 65 years of age or older. The median age is 35 years. For every 100 females, there are 98.00 males. For every 100 females age 18 and over, there are 96.10 males. Multnomah County was a bellwether county for much of the first half of the 20th century. However, since 1964, it has been the strongest Democratic bastion in Oregon. The Democrats have failed to win a majority in the county only two times since then, in 1972 and 1980. As Multnomah County is by far the largest county in Oregon, Democratic majorities in the county are often enough to swing the results in statewide elections. In 2008, Democratic challenger Jeff Merkley unseated incumbent two-term Senator Gordon Smith even though Smith carried 28 of Oregon's 36 counties. However, Merkley carried Multnomah County by over 142,000 votes, enough to allow him to defeat Smith by 59,100 votes. The principal industries of Multnomah County are manufacturing, transportation, wholesale and retail trade, and tourism. Since Oregon does not have a sales tax, it attracts shoppers from southwest Washington. The Port of Portland, established in 1891 and combined with the City of Portland's Commission of Public Docks in 1971, ranks third in total waterborne commerce on the West Coast, and 31st in the nation for total tonnage according to the 2009 American Association of Port Authorities' Port Industries Statistics. Portland is one of the five largest auto import ports in the nation and is the West Coast's leading exporter of grain and lumber. The Port of Portland is also responsible for Portland International Airport (PDX) in the northeast section of Portland, the Troutdale Airport a few miles east of PDX in Multnomah County, the Hillsboro Airport to the west in Washington County, and Mulino State Airport to the south in Clackamas County. Out of the 199 cities and counties located in the five West Coast states, Multnomah County ranked 198th in private sector job creation from 1997 to 2009. The county is home to a number of Portland-area attractions and venues, including Oregon Museum of Science and Industry, Portland Art Museum, Memorial Coliseum, Oregon Convention Center, Moda Center, Providence Park, Washington Park, Oregon Zoo, International Rose Test Garden, Lan Su Chinese Garden, Portland Japanese Garden, and Pittock Mansion. It is also home to the Historic Columbia River Highway, Multnomah Falls, and Oxbow Regional Park. The county was the birthplace of a mental health assessment matrix called the Multnomah Community Ability Scale. ^ a b "State & County QuickFacts". United States Census Bureau. Archived from the original on July 15, 2011. Retrieved November 15, 2013. ^ "Oregon Almanac: Abbreviation to Counties". Oregon Blue Book. State of Oregon. Retrieved July 4, 2007. ^ "Oregon Historical County Records Guide:Multnomah County History". Oregon State Archives. Retrieved August 1, 2009. ^ Genovese, Fran (February 19, 2009). "Politicians and scandal: a Portland-area tradition". The Oregonian. Retrieved December 10, 2011. ^ a b Oregon Blue Book (2009). "Initiative, Referendum and Recall: 1958-1970". Oregon Secretary of State. Retrieved June 18, 2010. ^ Oregon Secretary of State (1968). "State of Oregon Voters' Pamphlet General Election 1968" (PDF). Oregon State Library. Retrieved June 18, 2010. ^ Briem, Chris. "Some Major City-County Consolidation Referenda in the 20th Century". University of Pittsburgh. Archived from the original on July 8, 2011. Retrieved March 28, 2010. ^ Senator Lim (1997). "Relating to city-county consolidation; creating new provisions". Oregon Legislative Assembly. Retrieved March 28, 2010. ^ Bogstad, Deborah (1999). "Multnomah County March 30 & April 1, 1999 Board Meetings". Multnomah County, Oregon. Retrieved March 28, 2010. ^ "Children's Internet Protection Act; Questions and Answers". Multnomah County Library. Retrieved June 29, 2007. ^ Mitchell, Renee S. (May 5, 2004). "Once again, policy did not involve public". The Oregonian. ^ "Children's Internet Protection Act; Questions and Answers". Multnomah County Library. December 23, 2009. Retrieved March 28, 2010. ^ "May 2003 Special Election - Multnomah County - Measure No. 26-48". Multnomah County Elections. ^ "May 20, 2003 - Election Results". Multnomah County Elections. ^ Kelly House (November 4, 2013). "Former Multnomah County Chair Diane Linn returns to Portland with nonprofit job". The Oregonian. ^ "Deborah Kafoury takes office as Multnomah County Chair". multco.us. June 5, 2014. Retrieved July 22, 2014. ^ a b c d Manning, Rob (January 3, 2017). "Multnomah County Swears In All-Female Commission". Oregon Public Broadcasting. Retrieved January 5, 2017. ^ "Sharon Meieran, Commissioner, District 1". Multnomah County. Retrieved January 5, 2017. ^ Oregonian/OregonLive, Beth Nakamura | The; Oregonian/OregonLive, Betsy Hammond | The Oregonian/OregonLive The; Oregonian/OregonLive, Betsy Hammond | The. "Jayapal sworn in as Oregon's first Indian American to hold elected county office". oregonlive.com. Retrieved January 5, 2019. ^ "Susheela Jayapal". Multnomah County. December 19, 2018. Retrieved January 5, 2019. ^ "Jessica Vega Pederson, Commissioner, District 3". Multnomah County. Retrieved January 5, 2017. ^ "Lori Stegmann, Commissioner, District 4". Multnomah County. Retrieved January 5, 2017. ^ "District Attorney's Office homepage". Multnomah County. Retrieved November 22, 2010. ^ "Auditor's Office". co.multnomah.or.us. Retrieved November 22, 2010. ^ "Demographic and Economic Profile Fourth Judicial District OR Circuit Courts". fedstats.gov. ^ The leading "other" candidate, Progressive Theodore Roosevelt, received 12,523 votes, while Socialist Eugene Debs received 3,578 votes, Prohibition candidate Eugene Chafin received 761 votes. ^ "Port Industry Statistics". American Association of Port Authorities. Retrieved August 1, 2011. ^ "Portland's Economic Recovery and the Role of Trade". Friday Forums. City Club of Portland. December 2, 2011. Retrieved December 10, 2011. Wikimedia Commons has media related to Multnomah County, Oregon.